JVC, which has maintained a continuous presence in Times Square since 1979, has unveiled a new LED billboard that is the first true 720p high-definition display in New York’s Times Square. The focal point of the new billboard is a high-definition LED screen, but it features a pair of LED tickers with animated programming synchronized among all three LED displays, plus large “JVC” letters illuminated by neon. The new LED billboard is among the most impactful in Times Square thanks to the combination of its advanced technology and its location — just one story above ground level at Broadway and 43rd. Its close proximity to street level ensures that Times Square visitors fully appreciate the display’s crisp, high-definition images, the brightness of its 1.2 million LEDs and the brilliance of the nine-foot red neon JVC letters atop the display. JVC LED at Times Square. meets all the criteria for a true 720p high-definition display. To further ensure a crisp image, pixel pitch — or the space between pixels of the same color — is a mere 8mm. The main high-definition LED screen measures 19’ x 34’, and features a 16:9 widescreen aspect ratio. A new 71-foot LED ticker runs beneath the display and curves below the base of the JVC globe, which is encircled by its own 45-foot LED ticker. 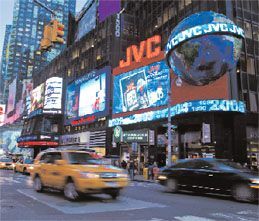 The JVC globe itself, a widely recognized fixture at the northeast corner of Broadway and 43rd Street since 1999, has been refurbished using high-density fluorescent paint. The new JVC billboard, called a “spectacular” in industry parlance, was created for JVC by Clear Channel Spectacolor, with the LED displays provided by D3 LED. JVC will showcase seasonal, promotional and product-related original content on the new billboard. To kick off the introduction, JVC began showcasing content related to an upcoming promotion, along with promotional messages for its camcorders, high-definition displays and car entertainment products.